I chose to adapt their idea by adding paint inside the ornaments for a bit more color. I had tattoos that were given to me by La petite épicerie that I hadn’t used and then I asked my friends on facebook if anyone had any lying around they weren’t using and sure enough a friend of mine gave me some that very evening! 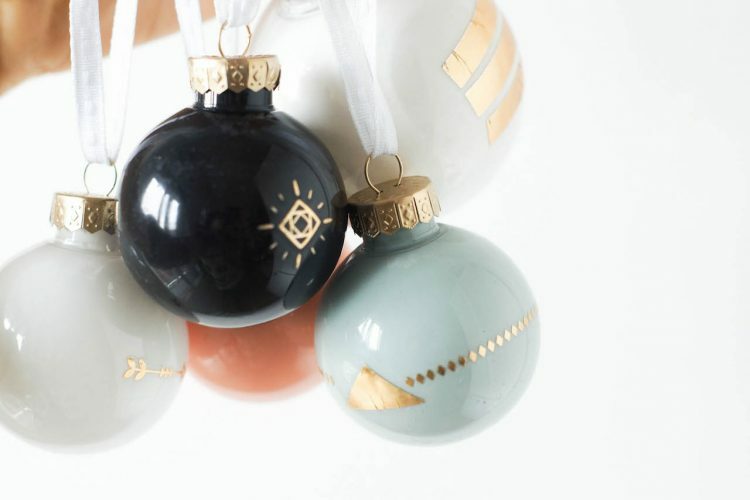 These DIY tattooed Christmas ornaments are super simple to make and you can adapt them to you colors and style ! I strongly advise you listen to this wonderful playlist as you make them!? 1-Pour paint inside the ornaments and close the opening with maksing tape and then SHAKE IT LIKE A POLAROID PICTURE! You could add a scellant (varnish) I didn’t and they seem to be holding up fine!